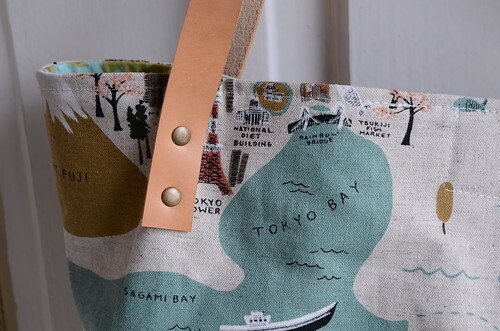 A wonderful friend who loves to travel just celebrated a milestone birthday and I had the perfect fabric to make her a gift. If you've been following along here for any length of time, you already know that I make a ton of bags. There are many great patterns available on the web and I've tried lots of them (Anna's are my favourite). 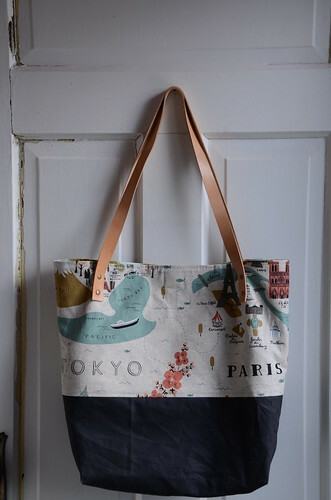 I designed and made myself a tote for my trip to Toronto last June and I ended up using it as my purse all summer. I wanted something uncomplicated, quick to make and I wanted to rivet leather straps to the bag after having so much fun with leather projects from Krista's book Beyond Cotton. It was just perfect for me and luckily I sketched out the dimensions and made note of the pattern-piece sizes when I made it so that I could recreate it for my friend. 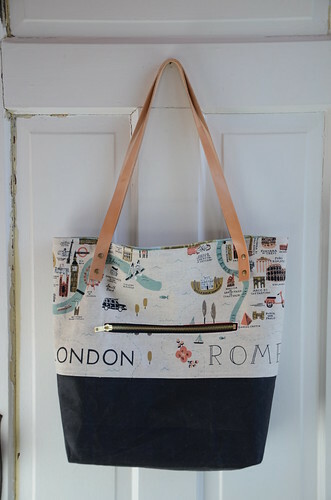 It's a basic, generous tote bag with all of my favourite features learned by making so many different bags: gusseted bottom corners, an external zip pocket, interior slot pocket, key fob and veg-dyed leather straps (that will darken naturally as the leather gets a tan). The top cotton/linen canvas is by Rifle Paper Co. for Cotton & Steel and the bottom portion is waxed sailcloth purchased from Drygoods Design in Seattle (I haven't found a local source). I love to line my pockets with a fun surprise fabric; in this case Lizzy House mini charm bracelets. 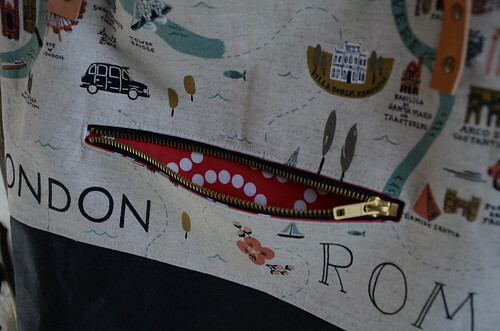 The key fob sits right above the slot pocket, so keys can rest in the pocket and not pull down on the top of the tote. There's also a magnetic snap closure at the top of the bag. I buy my leather locally at Lonsdale Leather in Vancouver. I lined the cotton canvas and lining fabric with lightweight woven fusible interfacing. You can't iron on the waxed sailcloth, so there's no interfacing on the back of it. I like a floppier tote, so this amount of interfacing is perfect for me. The waxed canvas is easy to wipe clean and is very durable. I'll definitely return to this design. 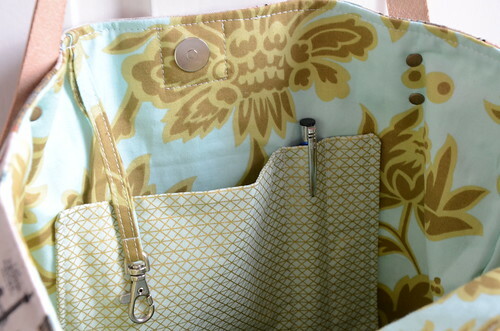 I certainly have enough cotton/linen/canvas fabric that is perfect for bags! Lovely! the fabric choice is fantastic! How much fun to make such a beautiful bag for a wonderful friend! It looks so well done!! looks great! I'm considering waxing some canvas from my VW van to make bags. We changed the tent after 30 years and there's lots of usuable fabric left in the old tent. What a thoughtful gift, so many nice features! Wonderful bag! Fabulous! And the fact that the recipient loves it makes the giving all the more fun!! It's just perfect, a fantastic gift. The recipient was thrilled on Instagram! It seemed to reach her quickly. Beautifully done!